A presentation of a book that can be called revolutionary in Armenian literature took place at the Narekatsi Center last week. “The Untitled Book” by Shushan Avagyan, 30, is a novelty both by its subject and structure. For the first time a literary work full of feminist ideas was presented to the Armenian reader with “daring girls seeking their daring mothers.” True, Shushanik Kurghinian wrote poetry on feminist subjects at the beginning of the 20th century, but it was consigned to oblivion by the literary world. 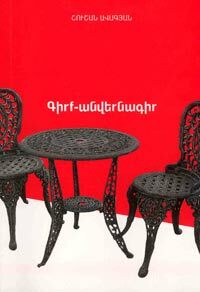 Last year Shushan Avagyan published Kurghinian’s feminist poetry in Armenian and English (see Kurghinian’s comeback). This novel restores the link between Armenian women intellectuals. Two of the main characters are two female writers consigned to oblivion – Kurghinian and prose writer Zapel Yesayan, who was killed in jail in 1941. The other two are contemporaries Lara and the author looking for them. The novel has no plot, which is a new thing in Armenian literature, it consists of fragments and the reader is supposed to find the internal link between them. How can the woman of our time know herself through the history presented by patriarchate, which is a lie, where the ideas of female emancipation are destroyed in Armenian reality? (“And how is she supposed to learn her history if every time she tries to take root in soil, she is uprooted?”). Or should she be looking, like an archeologist, for the real history whose fragments are buried in the ruins of the destroyed plot? And who should do the work? Only the woman who needs self-recognition and self-expression. “The Untitled Book” seems to be a text of fragments of archeological excavation and the restoring comment and poetry that links those fragments together. One fragment can open the whole essence of the novel, for example: “The difference between biography and autobiography is that the first one is complete and the second one is still being written,” that is, the novel is the autobiography of the Armenian woman writer who personalizes four generations (one generation is represented by Zapel Yesayan’s daughter Sofi). That’s why quotes from Kurghinian, Yesayan, her daughter, Lara have no quotation marks, the quotation marks are destroyed and the characters become identical. The investigators are identified with Armenian writers: “Let’s call the second writer Kostan Zaryan.” Why? In one article Zaryan called Zapel Yesayan a national turkey. And the first one is Nshan Peshiktashlyan. And so, state, public, intellectual authorities are identical in one general authority – patriarchate. The author regards Stalin repressions from a feminist point of view. By that view, the women – Zapel Yesayan is punished not only at the dictates of higher authorities that turned into an external enemy every more or less independent intellectual, but for being an independent woman who dared to compete with male writers. The author regards Stalin repressions from a feminist point of view. By that view, the women – Zapel Yesayan is punished not only at the dictates of higher authorities that turned into an external enemy every more or less independent intellectual, but for being an independent woman who dared to compete with male writers. The words of the investigators are also identified with women writers, they can be understood as words addressed to the three characters who cast a shadow on the works of a male poet and cause envy: “I have looked through one of your latest works and cast it away with disgust.” The Armenian literary environment is flooded with such investigators, who are indifferent to female literature or even welcome it until it conquers mainstream literature. And as soon as the name of a woman writer becomes famous, they try to destroy her from some ideological or moral position. A reader accustomed to plots will perhaps find it hard to read the novel. However, if a work broadens the limits of self-recognition for the writer, then the reader, who needs to broaden his opportunities of reading, will enjoy the novel, too. The publication of the novel was assisted by the Women of the Armenian World NGO, which offers the novel at www.armenianwomen.am.